How Laguna Beach does coffee! If you’re completely addicted to caffeine like I am, you’re probably going to stop somewhere for coffee at least once every single day! When you’re in Laguna Beach- dare to venture outside your everyday boring latte from Starbucks and experiment. Go to the uniquely Laguna Beach experience- Koffee Klatch. Koffee Klatch offers an expansive selection of specialty coffees, teas, chai, and blended drinks. My personal favorite is the Mayan Mocha. How can you go wrong when you mix cinnamon, chocolate, & coffee together in the same drink! I don’t know if the Mayan’s really drank their coffee this way- but if they did it, this drink might explain some of their historical success in dominating Central America! In addition to serving coffee, Koffee Klatch operates like a mini-restaurant. The kitchen serves an amazing breakfast and lunch menu (both served all day.) 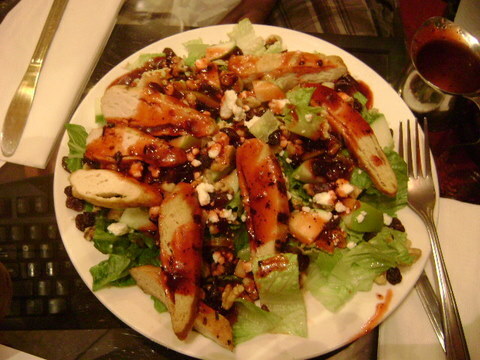 I recommend the Sweet Bistro Salad! But make sure that you bring a friend with you- because this heaping plate of romaine, sliced apples, raisins, walnuts, feta, grilled chicken all swimming in raspberry vinaigrette dressing might be too much food for one person! The mix-and-match décor of this place is a fantastic contrast to most commercialized coffee houses. I loved the myriad of couches, ottomans, benches, tables, and chairs arranged inside and out. They also offer free wi-fi and plenty of places to plug in- if you need to connect to the internet! Each day after you’ve enjoyed the Laguna Beach sunset they play a free movie so settle-in grab some dessert & enjoy the show! The people here understand that after all that coffee you might be up late, so they stay open until 11pm on Sun thru Thurs and on Fri & Sat they stay open until 1am. If you love coffee and a unique bohemian atmosphere come discover Koffee Klatch! Prices at the Koffee Klatch are exceptionally reasonable considering you are in Laguna Beach! If you prefer to enjoy your coffee while you watch the waves crashing on the beach, Koffee Klatch is only a short walk from Cress Street Beach! There is metered parking for Koffee Klatch available along Coast Highway (which usually don’t charge after 7pm.) Free parking may also be available in the residential streets if you’re willing to walk a little bit for your coffee, but you are parking in front of people’s homes so be extra careful to not block anyone’s driveway. Koffee Klatch is located on Coast Highway between Calliope and Mountain, across the street from the Surf & Sand Hotel. Is the Koffee Klatch One of YOUR Favorite Hang-Outs? 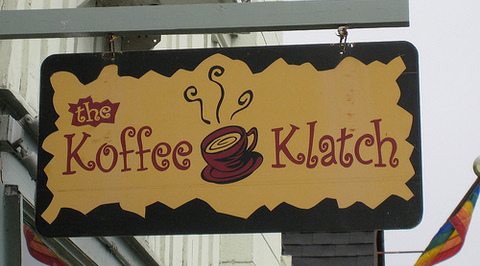 If the Koffee Klatch is one of your favorite local spots in Laguna Beach tell us your stories! Do you have a great stories about the Koffee Klatch? Share them! Enter the "Title" of Your Review or Story!